The Tánaiste’s words to the Security Council come days after a controversy over the strengthening of online copyright legislation. THE GOVERNMENT WILL make ‘internet freedom’ a priority during its time at the helm of an international security organisation, Eamon Gilmore has said. “Freedom of expression and freedom of the media” online were highlighted as key aims by the the Tánaiste during an address to the UN Security Council in New York today. He said the Government would organise a conference for 56 countries in Dublin next June on the issues at stake around online freedoms. 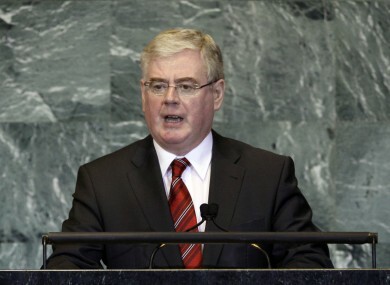 Gilmore was speaking weeks after Ireland took up the chair of the Organisation for Security and Co-Operation in Europe. His comments come days after the Government was caught up in controversy over the use of a statutory instrument to strengthen online copyright legislation. The measure was dubbed ‘SOPA Ireland’ by opponents, who said it risked jeopardising the operations of online firms including social media. We intend to prioritise the issue of internet freedom. As in other parts of the world, the threat to freedom of expression online is ever-present in the OSCE region and appears to be growing. We will work to ensure that existing OSCE commitments in relation to freedom of expression and freedom of the media apply to all forms and means of their exercise. He also highlighted measures which could be taken internationally to combat “corruption, money-laundering and terrorist financing”, saying the Criminal Assets Bureau could serve as a model for other nations to consider. Referring to the need for action to deal with conflicts occurring within some of the 56 OSCE countries, he said the Government would organise a conference on how the lessons of the Northern Ireland peace process could be applied elsewhere. Email “'Internet freedom' is Government priority, Gilmore tells UN”. Feedback on “'Internet freedom' is Government priority, Gilmore tells UN”.